Poachers Break Into French Zoo, Kill White Rhino And Steal His Horn : The Two-Way This is believed to be the first such incident at a European zoo. The zoo says its staff is in shock. The suspects remain at large, and police are investigating. 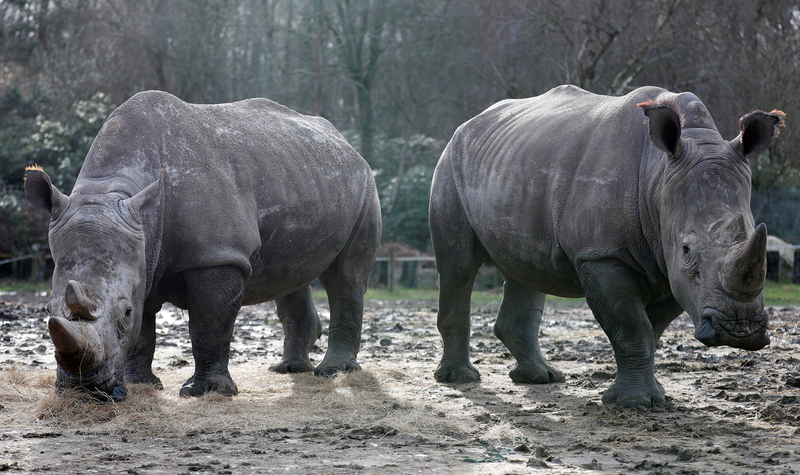 White rhinoceros Gracie (left) and Bruno — seen in their enclosure at Thoiry Zoo in France on Tuesday — are safe. Poachers broke into the zoo overnight and killed a 4-year-old male white rhino named Vince. "It is extremely shocking what just happened," zoo director Thierry Duguet told France's 20 Minutes newspaper. "An act of such violence, never before seen in Europe." Duguet told The Associated Press that Vince was shot three times in the head. The poachers likely used a chainsaw to cut off one of the horns, according to a statement from the zoo, which is nearly 40 miles west of Paris. It added that "his second horn was only partially cut, which suggests that the criminals were disturbed or that their equipment proved defective." A police spokesman told The Guardian that "it's possible the thieves didn't have time to take the others." The zoo confirmed that its two other white rhinos — 37-year-old Gracie and 5-year-old Bruno — "escaped the massacre and are safe and sound." "Vince was found this morning by his caretaker, who, being very attached to the animals she cares for, is deeply affected," the zoo wrote. "This odious act was perpetrated despite the presence of five members of the zoo staff living on site and surveillance cameras." Despite bans by international convention and French law, the illegal sale of rhino horns persists because of demand for use in traditional Asian medicine. A kilogram of rhino horn sold on the black market for nearly $54,000 in 2015, according to the zoo. Southern white rhinos like Vince were nearly extinct in the late 19th century, according to the WWF. Protection efforts were largely successful, with some 20,000 animals in protected areas and private game reserves — in fact, they're the "only rhinos that are not endangered." But there's been a major uptick in poaching. "Hundreds of white rhinos have been killed annually in recent years," the WWF says. "They are particularly vulnerable to hunting, because they are relatively unaggressive." Vince was born at a zoo in the Netherlands, and had been living at Thoiry Zoo since 2015. In the aftermath of the attack, Thoiry is warning other European zoos. "Animal parks throughout Europe have been put on alert to look out ... to get into these places they have to climb 3.5 metre fences, go through padlocked doors," said Paul de La Panouse, the former director of the zoo's African enclosure, according to The Guardian. He added: "It's not easy to kill a rhino weighing several tonnes just like that. It's a job for professionals."